Final game for Windows out now on HumbleBundle and Steam. This is the early beta build and features some of the main game mechanics, surprises and plots. * Use Wine[www.winehq.org] to run the demo on Linux and Winebottler[winebottler.kronenberg.org] to run onMac. Enjoy this early demo of Urban Pirate and check out www.urbanpirate.babyduka.com for the final release. No install needed. Just run the .exe file in the downloaded folder and keep folder intact (will include save-file). 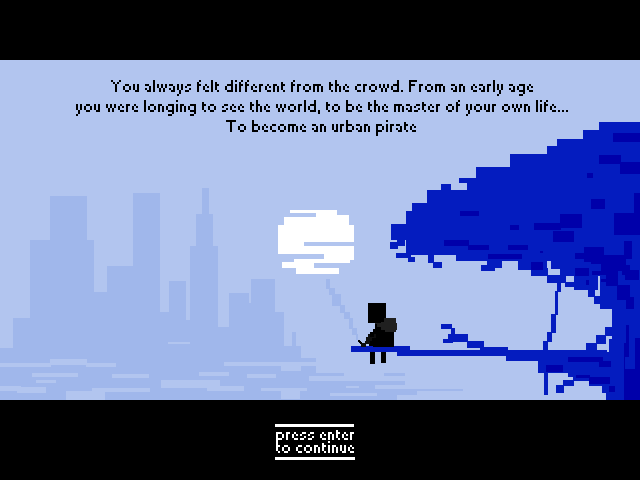 THANK YOU FOR PLAYING URBAN PIRATE!